Whether it’s Game Day or Monday, these Easy Frosted Chocolate Nut Cookie Bars are sure to be a hit! Even my family, who hates nuts in their cookies, loved these bars! So you guys are pretty special. TWO football treats in a row! Last week I shared my Cookies and Cream Cheese Ball recipe (shaped like a football) and today you get these cookie bars! Let me first preface this with, if you hate nuts in your brownies and cookies, please keep reading. My family is normally very against me putting any kind of nut in our cookies and brownies, and yet, I LOVE them. The nuts and my family! But these bars? Truly delicious. 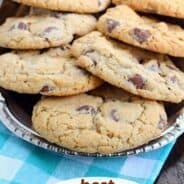 I took my favorite chocolate chip cookie recipe, changed it up a little and added some cocoa. These cookie bars resulted in a chewy brownie-ish treat. Chock full of chocolate chips, walnuts and almonds. I then proceeded to spread the most decadent chocolate almond frosting on these bars. Seriously, I could guzzle down a gallon of almond extract. Okay, no, I can’t. That would make me sick. But I do love to add it to baked goods. And frosting! You can leave it there. A big batch of frosted cookie bars for family and friends for your Superbowl party. You can hike up the fun factor and make footballs! 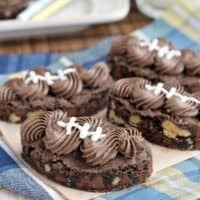 I used a 2 1/2 inch oval cutter for these football shaped cookie bars. So easy. And, with your leftover cookie bar scraps you can make this insanely delicious Chocolate Cake Shake. OMG, it’s great with brownies, cakes, you name it. Don’t knock it till you try it! Still want footballs, but you don’t have a cookie cutter? (or you don’t want a plateful of cookie scraps?) Cut your bars into squares. When you pipe on your frosting, it will still have the cute football appearance. So now tell me, do you like nuts in your baked goods? 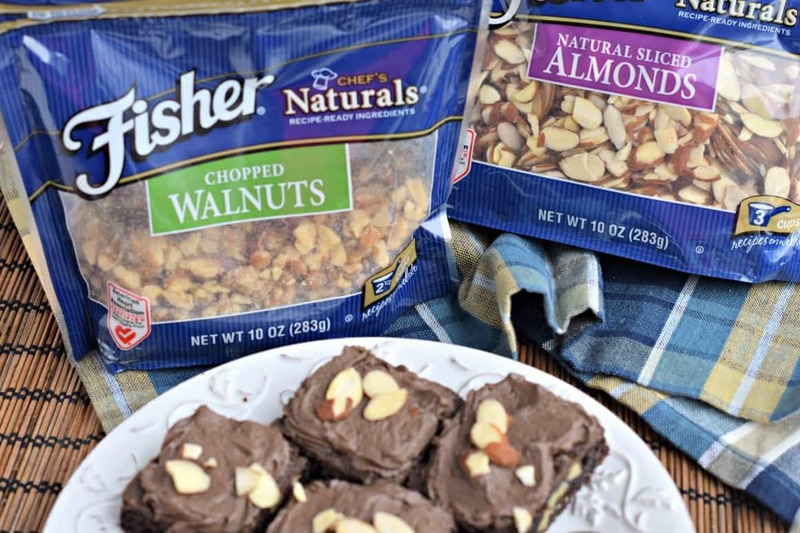 Try using Fisher Nuts, in the blue bag! I find them to have the perfect, fresh taste and crunch. Every time. Plus, they come in resealable packages! This year while planning your game day menu, think Fisher. 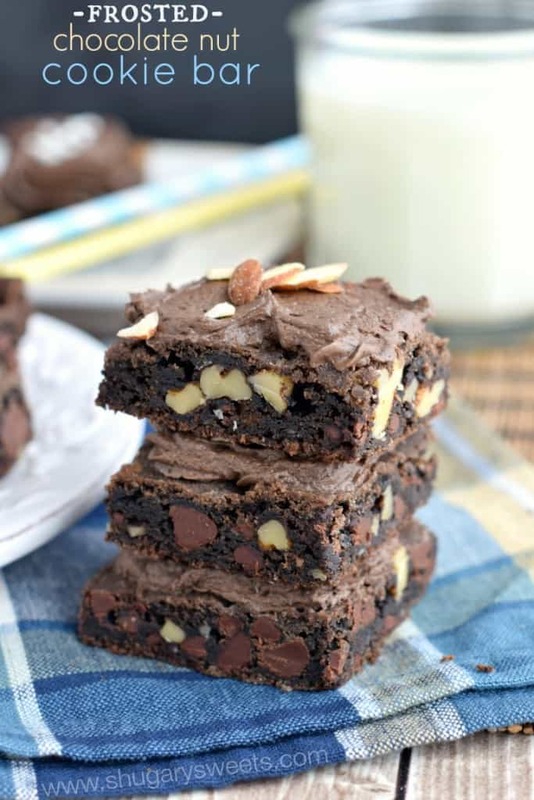 Delicious chocolate nut cookie bars! For the cookie bars, preheat oven to 375 degree F. Line a 15x10x1-inch baking sheet with parchment paper. Set aside. In a large mixing bowl, beat butter with brown sugar for 2-3 minutes until fully combined. Beat in vanilla and eggs. Add flour, cocoa, salt, baking soda, cinnamon and nutmeg. Blend completely. Fold in chocolate chips and nuts. Drop cookie dough onto parchment paper lined baking sheet. Using finger tips (dipped in flour) press cookie dough into pan evenly (dough will be sticky, so keep dipping those fingers in flour). Bake for 22-25 minutes. Do not overbake. Allow to cool completely in pan. Once cooled, cut cookie bars into desired shape, either squares or using a cookie cutter. For the frosting, beat butter for two minutes until soft and creamy. Add almond extract, cocoa, powdered sugar and 2 Tbsp milk. Beat for 3-4 minutes until light and fluffy, adding more milk if needed. These are adorable for Super Bowl 🙂 Also I love nuts in almost everything. So I definitely didnt need convincing with this recipe! These are the cutest football bars, Aimee! I love your creativity! 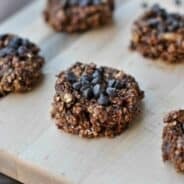 My husband and I take our game day snacks pretty seriously, so these sound like a perfect addition for next Sunday. Pinned! Haha, I love that you take snacking seriously! That’s awesome 🙂 Thanks for pinning Gayle! Looks SO good! I love the little football shaped brownies. perfect for the Super Bowl. LOVE! Anything chocolate with nuts is up my alley…and the footballs. So cute! Great cookie bars. Look scrumptious. I can’t wait to try them. thanks for sharing. These are adorable! I love the football shapes especially. And that frosting. You are my frosting queen! You were a smart thinker, doing a regular bar and a football shaped one!! I’ll have to remember that concept! I remember dying over these on Instagram! The chocolate, the nuts, the ALMOND CHOCOLATE FROSTING. These are the most perfect brownies that my taste buds ever did see. So darn cute! The kids and adults will gobble these up at my superbowl party. Thanks for a great recipe! Get out of town with these. They are toooooo cute! I love nuts in EVERYTHING, so I’m totally sold on these! Holy deliciousness! Let’s see how many I can stuff in my mouth at once! The football shapes are adorable. Pinning! I love that you cut the cookie bars into shapes! I’ve got to give that a try! These are absolutely adorable and so perfect for my Super Bowl Sunday menu! 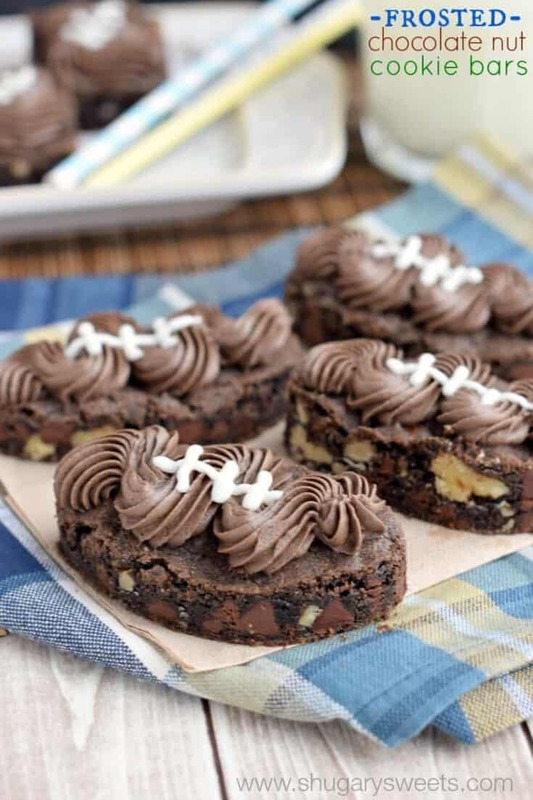 I’m not a huge football fan, but I’d take some of these brownies! These are so fun! Perfect addition to the game day spread! These are so fun! 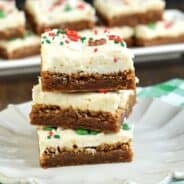 I am excited to see such a great game day dessert recipe, because I always have so many salty and savory snacks on the menu. This is just what I needed! How cute are these?? Perfect for game day! I used to hate nuts in any baked goods and ice cream. But now I love ’em in baked goods! The cookies look great, Aimee! Those chocolate chunks, the nuts. Mmmm. 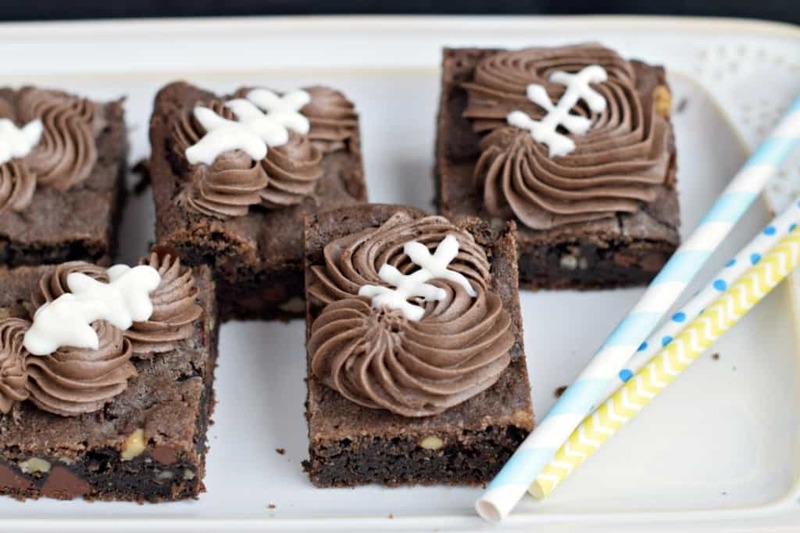 If I were eating Football shaped brownies on Superbowl Sunday, I would not be bummed. Love the twist for the big game! I’m originally from the “no nuts in my baked goods” camp but I’ve been converting! 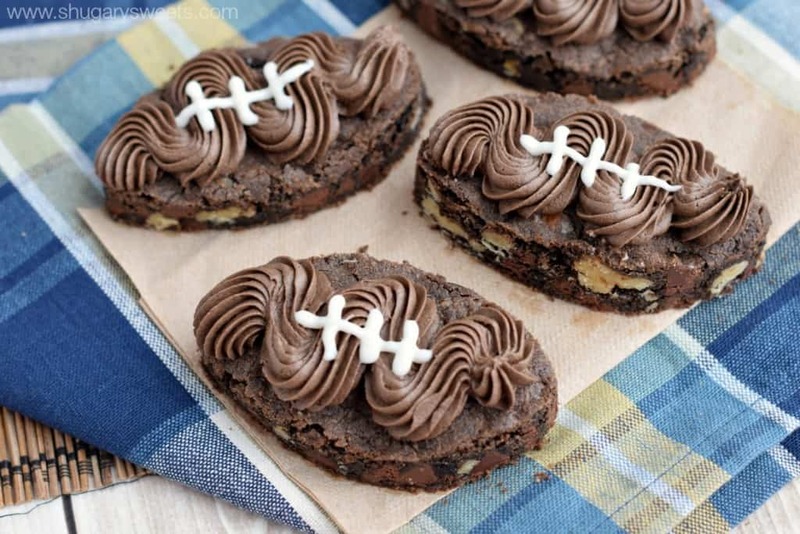 These cookies bars look so decadent and delicious and the football shaped ones are sooo cuuute! This is my favorite kind of football. These cookie bars look wickedly delicious and I totally am drooling over all that frosting. Wish I had one now! My wife just made a batch of these – except basketballs. Simply delicious! Love the basketball idea 🙂 Glad you enjoyed them! Whipped up a batch of these last night and am officially addicted to them. The football idea was a huge hit with my kids when we prepared them for a birthday party. Thanks for sharing! I made a batch of these recently, they turned out to be AMAZING! These look absolutely amazing, can’t wait to try them! These are so much fun I recommended them to my mom to make with my eldest daughter for the big game tomorrow and they are so excited! Can’t wait!